Okay I am still behind in my blogs- I’ve written several I’m hoping to create a few more and then turn them into my editor- so please excuse all of my mistakes this is raw ramblings. So I have won two awards recently and this is the perfect time to honor them- see blogs come to those who ask *snickers* You love my editor now don’t you, Kilian would have stopped that. I won the Sunshine award from Patricia Yager Delagrange Patricia blogs about animals I always learn something new from her blog and get to see the best pictures! 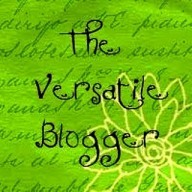 I also won the Versatile Blogger Award from the lyrical and poetic Bill Jones Jr.
For both awards I’m supposed to tell you things about myself. I’m going to try and pick stuff I haven’t mentioned before without incriminating myself too badly. 1- I was born in Atlanta, Georgia I left when I was four so I can’t do that sickly sweet southern female manipulation thing, but there are a few words like pecan that I say with a Southern accent sometimes. 2- I love snickers bars- love them. 3- I became vegetarian when I was sixteen while I was working at a health food store. Only time I stopped was during my first pregnancy when I had skin crawling intense food cravings. 4- I had an ancestor who fought in the Civil War named Zopher. 5- My last name is a combo of my first husbands name McKenna and my current hubby Johnson. I hyphenated only to keep my last name the same as my sons. My hubby wanting to be a family also took McKenna so he’s a Mckenna-Johnson and our daughters last name is Mckenna-Johnson. 6- I was sixteen when I fell in love for the first time, his name Michael Lawrence Price- I have no idea where he is now. I wish I knew. 7- A friend taught me how to do tequila shots out of Baby Loony Tunes sippy cups. 8- Muppet Treasure Island is one of my favorite movies. I made my son watch it a lot when he was little. 9- I ran track in High School- I wasn’t a valued member of the team. 10- I cried the first time I saw my son in a suit. He was fifteen, I think, and he looked so grown up I just couldn’t help but tear up. That might be one of his most embarrassing moments. Heather Hawkes a dear friend who blogs about homeschooling and her journey to becoming a lactation consultant. Lani Wendt Young fellow YA author and half crazed mom. 🙂 She also posts pictures of lovely Samoan men with tattoos. Lesann Berry who makes me laugh and blogged about a pirate festival I must go to one day! Mhairi Simpson who’s journey I enjoy watching. Marlene Dotterer who introduced me to Thomas Andrews the shipbuilder for the Titanic, a truly remarkable man. Thanks Alica! gotta say that I cried when i saw my son all dressed up in a suit as well. And when he went to his first dance? Cried then too. And also tried to stalk him through the church hall windows…but thats another story altogether. It is possible that I am a bit stalkerish on facebook- but his friends should adjust their privacy settings if they don’t want people to see their pages! Thanks Lani! Best use of Loony Tunes sippy cups ever. 🙂 These are great; thanks for sharing. Now that I know I’m all poetic and lyrical, I’m think the name Bill Jones no longer fits. Something more poetic … like, Jardesh Visiwaugh, or Zazu Zopher. Yeah, that’ll work. Please feel free to use Zopher- I don;t think I will be doing so! Isn’t it crazy how intense those pregnancy cravings (and repulsions) can be? I couldn’t eat a green veggie to save my life in my second pregnancy. I gagged every time. Guess what my second child won’t eat? Zopher? That’s kind of cool. Michael Lawrence Price, hey? Sounds like some cyber stalking—er, researching—is in order. 😉 Congrats on the awards! You should celebrate with a Snickers. I’ve tried to find him in the past- maybe I should try again- of course I don;t remember anything else- birthday or such. Oh well, I can but try. Thanks August! I can just picture those tequila shots. Must have been some afternoon! Thanks for the award. I’ll try to be creative! Thanks for the award! I feel all bloggery now. I’m already gearing up for the weepy moments and the Wee Beast is only five. I can’t even imagine the waterworks the first time he dresses up for some sort of date-event. Ack. I loved learning more about you, Alica. Tequila from Loony Tunes sippy cups sounds fun 😀 And bless your husband for changing his last name too to fit the rest of the family. Congrats on the awards! I love the facts you shared, especially about your last name. What a cool husband you have! Great story. Thanks so much Karen! It’s been a joy watching them grow up but some days I long of the baby that I held. Thanks Jolyse! I tried not to give everything away. Poor boy he was so embarrassed. Thanks!